It had been a rather strange day. I had been checking on the radar at work. There had been some storms develop bear Oberon and Bathurst on the Central Tablelands, this is often where the first cells of the day develop, especially in weak trough conditions like today. However the odd thing was that by mid afternoon these earlier cells had almost died out, not a good omen at all. Looking again at the radar at 4.30pm a small blotch just north of Canberra ( Australian Capital Territory ) took my interest, but I had to wait until 6pm to leave work. When I finally left I noticed a small cell about 50kms northwards, it was very weak, just a congestus that had just started to glaciate, and and I honestly did not give it much chance. I headed north regardless. As I drove north the situation was changing rapidly, two, then three extra pulses had gone up behind the first. 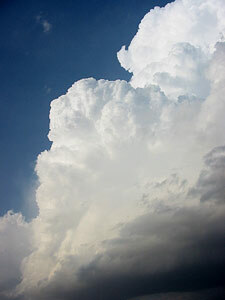 At the small town of Sutton a lovely rain free base developed under a crisp updraft. 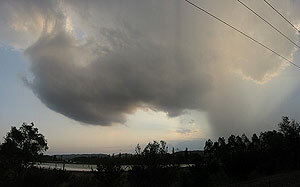 I watched this for a while, before finally rain started to fall and the cell became outflow dominated. 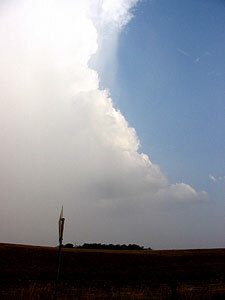 I headed NE through the rain core, but upon emerging 5 mins later saw nothing but old anvil and blue sky. I should have realised it earlier, but the pulses were going up of the southern flank, the reverse to what I normally expect. I headed back south and caught site of another pulse. Road options had me going through the core again, I emerged this time at the ranges overlooking the town of Bungendore, NSW. 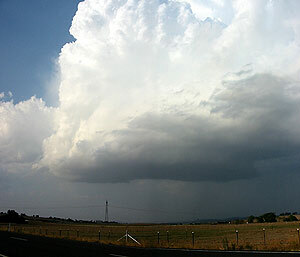 Small hail fell, and at one stage hail was the only precipitation and was falling onto dry road. It was here that the storm died. There could have been several reasons - the drop in altitude, a weak sea breeze front or simply it was getting too late in the day. I was left with one lovely shot however, that of a series of old anvil pulses all lined up in a straight line stretching off to the east. This was not one anvil, but many seperate pulses. This series of storms was over. 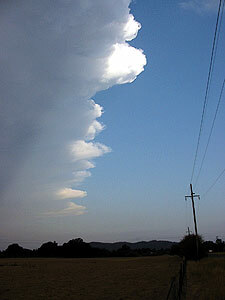 But a convergence line to the west over western Canberra was forming into another weak storm.